Gifts are items that everyone loves, and if one talks of personalized gifts, they are like cherries on the cake. When gifting something to men, we are generally short of ideas about what to gift and what not. But if you search well you can select from many customized options, creative gifts and others to make your men- husbands, boyfriends or friends surprised and happy. 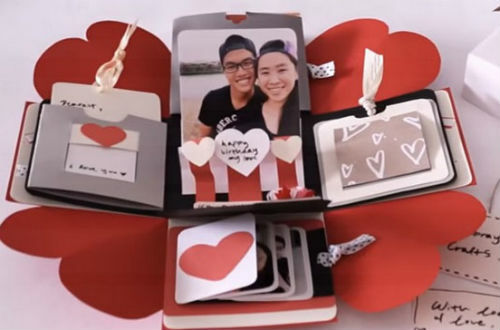 Photo album– It would be the best option to give a photo album of your lovely memories, which will help relive the moments between both of you. Pictures can be selected date wise, holidays wise or year wise. Nowadays we all have digital prints, but hard copies are worth treasuring. Coffee mug- Why not make mornings cheerful for men by gifting coffee mugs? Every sip of tea or coffee will remind him of you, the picture on the cup will be a beautiful life long memory, and every morning the thought of you will be with him whether you are with him or not. Fridge magnets– Fridge magnets are wonderful means to stay connected and see your loved ones daily. You can add a message to the fridge magnet, get the message printed and gift it to him for a lifetime memory. Letters, handmade cards-If you are good at creativity you can make a beautiful card for him. In the Internet era, handmade things are invaluable and they show your care and affection. You can express your feelings on paper, and use calligraphy to hide the letter before his birthday, and let him search. It will be a treasure hunt to find all the letters written by you with a wonderful memory attached to it. Personalized key chains or mobile back covers– If he is fond of driving or gadgets, you can gift him with a keychain with your picture or any message written on that. You will be with him wherever his keys are kept. This is very easy to print and it is available in variety of deigns too. Along with a keychain you can gift him a mobile back cover with the lovely picture and a quotation. T shirts with his photo– You can gift him a t shirt with a picture of him, a casual t shirt and a one liner written on it. Be it be your lover, your best friend, your brother or your father, you can change the messages accordingly. This will remain with your loved ones forever. Pillow and bed sheet cover with a photo– When you are giving your hubby this gift, this could be one of the best. Heart shaped pillow or cushions will be always near to his heart, the warmth of your relation and the love between you can be felt by this. It will strengthen your bond and make your love deeper. Surprise the men with wishes from all the family member and friends– You can personally request his family or friends to record their videos and send to you with a message. You can then club all the videos, go to a video shop which can edit it for you and prepare a CD or a pen drive and gift, which the whole family can watch together and cherish. Other gifts– Other photo options such as photo frames, collage, personalized wall clock, engraved wine glasses, laptop skin cover, personalized revolving photo cube, stylish personalized pen with his name written and many more can be chosen. Always present a kind of gift which is remembered more by feelings and not by money!